A recent issue of BizBash Magazine Florida featured Uplyte’s mini LEDs (light emitting diode) which can be submerged in water and have twice the brightness of traditional LEDs. 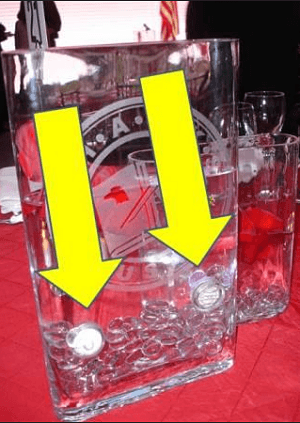 They have a 12-hour battery life in water, which is plenty of time to drop them into the base of a centerpiece and let them glow through the speakers, dinner, live auction, entertainment, and whatever else you’ve got planned for the benefit auction. 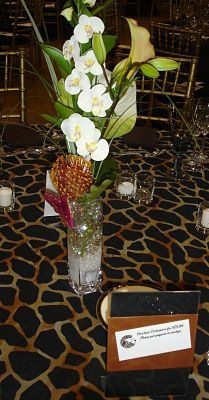 This auction centerpiece used a square LED in the base of its square vase. Another plus is that they have an on-off switch for multiple uses, unlike pull-tabs which are used once and then burn out. And unlike candles, they won’t “ignite” anything. A few of our auctions incorporate ice sculptures into the decor. Certainly these could be used to illuminate those. Each light and casing is about 2″ X 1.5″ and comes in white, green, red, blue or amber. They cost $1.65 each with a minimum order of 10 pieces, or $1.50 each if you order 100. Fairly modest price, for the effect. Uplyte is based in Hallendale, FL. We used these in martini glasses for our gala one year. They looked great!!!! Keep the great ideas coming. Nice! A high-tech looking martini. Like George Jetson. Yellow LEDs? I’m sure they do, Jessica. Check with the company mentioned.